Over the last 40 years, we have bred many wonderful dogs, of which 230 became famous showdogs. 4 of these champions you see on the picture taken in Almkerk/Netherlands 1993. The Beardie males Ch. Shilstone Diplomat and Ch. Shilstone Choir Boy together with the 2 Bobtail ladies Ch. Uniclever and Utopia aus dem Elbe-Urstromtal. It is more than 30 years ago that we had our first litter. During the many years 111 Beardie champions, have proudly and successfully represented us worldwide at numerous shows. 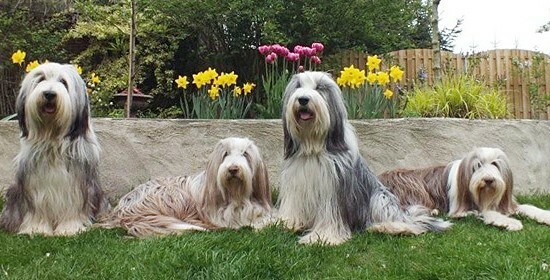 Another 9 Bearded Collies have to be added to this result. They where bought from other breeders but made up as champions by ourselves. These dogs got their own homepage containing more information like their pedigree and showresults.